Pixar, the animation team behind Toy Story, A Bug's Life and Monsters, Inc, is bouncing onto the big screen again with underwater adventure Finding Nemo, which has already been a huge hit in the US. Pixar's success story begins back in 1995, when it released Toy Story which revolutionised animation at a stroke - and turned its makers into the pioneers of a new way of cartooning. Eight years later, Pixar's reputation as the Midas of animation looks in no danger of disappearing. The US box office charts have in 2003 been ruled not by Keanu and co's overblown Matrix sequel, nor by Governor Schwarzenegger's latest turn as the Terminator cyborg, but rather a heartwarming tale of a fish's search for his stolen son. 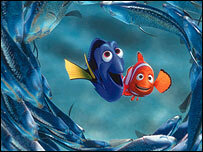 Finding Nemo, Pixar's latest offering, made more than $70m (£44.8m) on its opening weekend in the US in June. It has since gone on to make more than $335m (£214m) in the US alone by the end of September. Pixar have the enviable reputation of having a hit with every film they have made - Toy Story, A Bug's Life (1998), Toy Story 2 (1999), Monsters, Inc (2001) and Finding Nemo. It is a situation few other Hollywood studios can ever have related to. But it is not just down to the films and their outlandish characters. RenderMan, Pixar's software for taking computer-animated footage and dropping it seamlessly into live action, has been used in a wealth of recent blockbusters, such as the first two Lord of the Rings instalments, the Harry potter films, and Pearl Harbor. Pixar began 18 years ago, when animator John Lasseter left his job at Disney to join the computer department of Lucasfilm, the company run by Star Wars creator George Lucas. A year later, the company was bought by Steve Jobs, the co-founder of Apple. The new company was christened Pixar. Jobs, Lasseter and computer graphic expert Ed Catmull initially concentrated on making software. But soon they were making shorts and commercials, using film-makers Andrew Stanton and Pete Docter. The shorts the company made in the 1980s and early 90s paved the way for the big screen gems to follow. First there was Luxo Jr, a short film about father-and-son desk lamps. It earned a best animated short animation prize at the 1987 Oscars. A year later and Tin Toy, the story of a baby that causes mayhem to its collection of toys was made. The shorts were taxing, complicated labours of love. Four minutes of screen time - the length of the Pixar's chess caper Geri's Game, could take computers two years to animate properly. But Pixar became a true sensation in 1995 with the release of Toy Story - which was partly funded by the cartoon giant Disney . 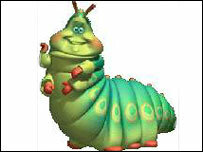 It tapped into Lasseter's unabashed love of toys. Like Tin Toy, it was set in a world where toys came to life, and revolved around favourite toy cowboy Woody (voiced by Tom Hanks) and his paranoia over a new pretender, the blissfully ignorant spaceman Buzz (Tim Allen). This was not simply a computer-generated copy of its bigger partner's films - Toy Story had pop culture references to keep adults amused while children revelled in its day-glo daydream of toys coming to life. This was one of Pixar's essential hallmarks. Lassetter and his team created characters full of foibles and faults, but much more empathetic than the usual cast of cartoon favourites. Strong stories - and some rather complex themes - were staples of the Pixar structure. Armed with a cheeky sense of humour and wisecracking style, it was no wonder that the Pixar films seemed pioneering. Suddenly, animated film-makers were having to throw away the rule book and look at how Pixar was doing things. 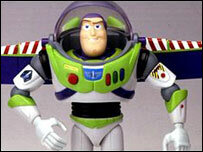 Toy Story quickly made more than $320m (£205m) around the world, and was the highest-grossing film of the year in the US. At the same time, Pixar became a public company, raising more than $140m (£89.7m) to become the biggest IPO of the year - a company that has floated on the stock market. This was not just down to their big-screen success. All the time they were making short films and computer-animated TV adverts, they were also pioneering computer software. 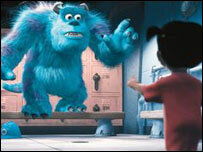 Pixar's success led to a raft of imitations by Disney and Dreamworks. The latter released the insect cartoon Antz in 1998 only to find its thunder stolen by Pixar's A Bug's Life. Shrek, Ice Age, Jimmy Neutron: Boy Genius and Final Fantasy: The Spirits Within are other big-budget animated films that have appeared in Pixar's slipstream. As the company prepares for a decade making features, the only credible criticism coming its way is that Finding Nemo is perhaps not as edgy as their earlier films. Given that Pixar's Ed Catmull once said to the Los Angeles Times that Steve Jobs' edict was that the company "should never be safe", it is an odds-on bet Pixar have got an answer for that too. What is Pixar's best film?